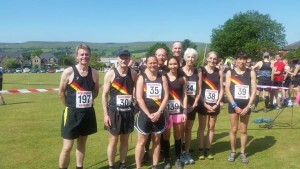 Edenfield Fell Race | Rochdale Harriers & A.C.
Sunday 3rd June saw eight Harriers compete in Rossendale Harriers’ Edenfield Fell Race. The 6.4 mile race starts with a long climb up to Cowpe Lowe, then a downhill section to the Pennine Bridleway and up again past Waugh’s well. After the Well runners ascended yet again, to Whittle Pike cross. From there a tussocky descent takes competitors through a boggy section before a final calf-burning scramble, swiftly followed by a mile and a half steep downhill plummet to the finish on Edenfield Cricket Club pitch. Another sunny day saw runners tackling the 1565ft ascent in very warm conditions. First Harrier home was Alex Frost who continued his excellent season to finish 43rd overall in a time of 55:49. This was over four minutes faster than Alex’s time the previous year. Next Harrier to cross the line was ladies captain Jill Butterworth (4th lady – 1:01:51), securing another maximum 50 points towards the Run The Moors Grand Prix Championship. A close finish with team-mate Nick Walsh saw him cross the line just 14 seconds later. Next over the line was John Mayall (1:07:33), followed by Anna Blomfield and Stephanie Harrison who were separated by just 33 seconds (1:09:18 and 1:09:51 respectively). Matt Cox finished in a time of 1:17:35, followed by Karen Conduit (1:31:40) and Nicola Smith (1:39:07).